Need an easy-to-use B-roll editing app? Filmakr has got you covered. Filmakr makes adding B-roll over audio a snap. Just drag-and-drop one clip on top of the other. Boom. You’re done. Before releasing our b-roll feature, Filmakr creator George Spyros made a little preview video. 1. A clip of girl doing the splits was recorded with audio of a woman speaking off screen. 2. A clip of an on-camera, speaking shot of George was recorded with the selfie-camera. 3. In the video, we see both clips playback. 4. The girl clip in dragged and dropped on top of the clip of George speaking. This creates a clip with B-roll. a) The video of the girl plays while we hear George’s audio. b) The audio from the shot of the girl has been automatically turned off. 1. The clip with B-roll is dragged up and dropped. The B-roll video is detached. 2. The speaking shot is played partway through and stopped. 3. Double-tap the clip to enter Clip Mode. 4. Tap Slice button or Swipe Down. 5. In Slice Mode, tap SLICE button. The clip is split into two clips. 6. The girl clip in dragged and dropped on top of the second clip of George speaking. This creates a clip with B-roll. a) The video of George plays until the clip with B-roll (video of girl plays while we hear George’s audio). 1. 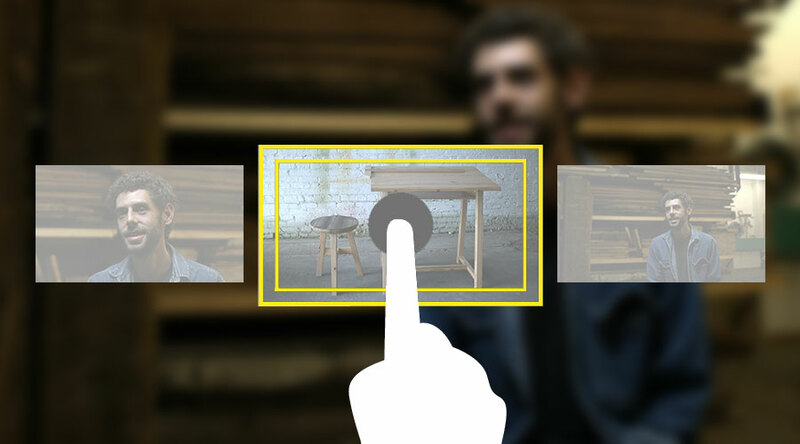 Double-tap the clip with B-roll to enter Clip Mode. 2. Tap on Motion Button. 3. Change speed from FIT to Slow-Mo. 4. Set Slow-Mo speed to 48 fps. c) The shot of the girl plays in slow motion so that the motion in the shot ends at a better time. We no longer see the junky part of the shot at the end. As your goto b-roll editing app, we’ve developed some innovative (patent pending) ways to making stunning videos. This short film about the Beastgrip created entirely with Filmakr uses tons of b-roll. • By default, if the video clip dragged to create B-roll is shorter than the A-Roll (audio) clip, the B-Roll shot is automatically slowed-down, stretched to cover the entire A-Roll shot. You can change the speed of the clip to undo this. • Trim both A+B-Roll simultaneously. – Trimming the head to the right chops off some of the top of the A-Roll by trimming into it. The B-Roll in-point remains the same, therefore the last frame of the B-Roll video will come earlier. OR for FIT B-Roll, the slow-motion speed will be adjusted to be less slow. – Trimming the tail to the left chops off both the A-Roll and the B-roll making the entire clip with B-Roll shorter. – Trimming the head to the left adds more footage to the top of the A-Roll. The B-Roll in-point remains the same, therefore the last frame of the B-Roll video will come at alater point in the video footage. OR for FIT B-Roll, the slow-motion speed will be adjusted to be more slow. – Trimming the tail to the to the right adds footage to both the A-Roll and the B-roll making the entire clip with B-Roll longer. 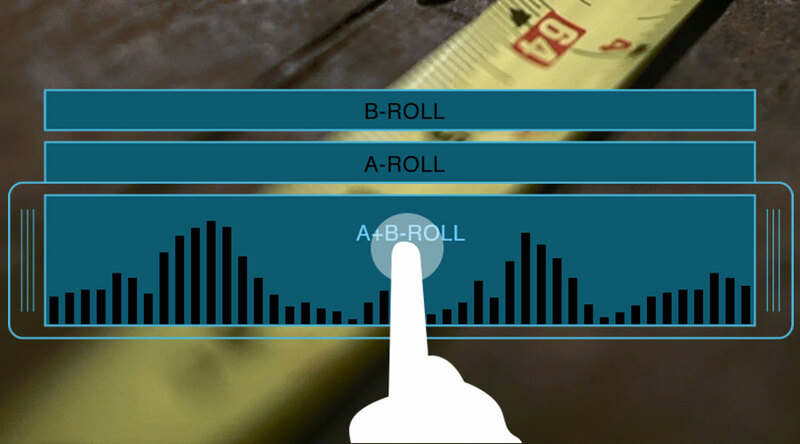 • Trim A-Roll only: tap to toggle through TRIM A+B-ROLL, TRIM B-ROLL, TRIM A-ROLL. – Trimming the head to the right is the same as trimming A+B-Roll. – Trimming the tail to the left is the same as trimming A+B-Roll. – Trimming the head to the left is the same as trimming A+B-Roll. – Trimming the tail to the right is the same as trimming A+B-Roll. • Trim B-Roll only: tap to toggle through TRIM A+B-ROLL, TRIM B-ROLL (stop here), TRIM A-ROLL. – Trimming the head to the right changes the start point of the B-Roll to a later frame of video. – Trimming the tail to the left changes the end point of the B-Roll to an earlier frame of video. For non-FIT B-roll, the video will be shorter. For FIT B-roll the speed may become more slow motion as there is now less video to display over the A-Roll. Slowing down the video is now necessary to cover the A-Roll entirely. – Trimming the head to the left changes the start point of the B-Roll to an earlier frame of video. – Trimming the tail to the right changes the end point of the B-Roll to a later frame of video. For non-FIT B-roll, the video may be longer. For FIT B-roll the speed may become less slow motion as there is now more video to display over the A-Roll. Less stretching is now required. B-roll is an important part of quality storytelling. Cutaway shots can either support of provide contrast to what the audio says. This is yet another feature that makes Filmakr the best video editing app for iPhone.